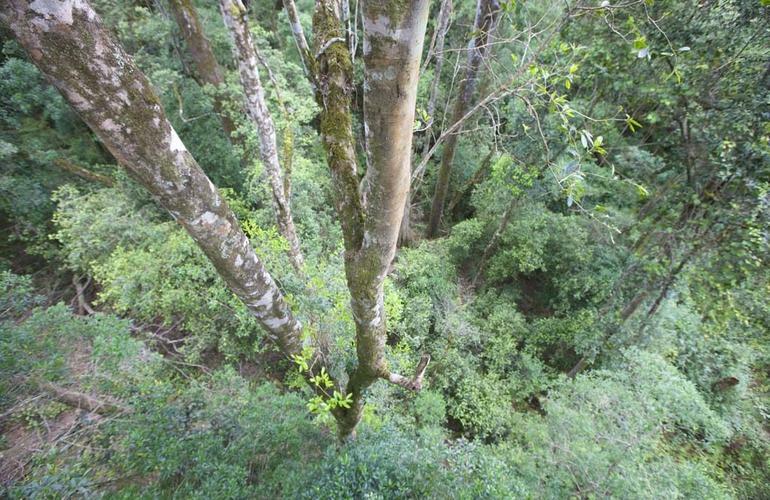 Standing within the crown of these giants and looking down at the lush forest floor thirty metres below is an experience of a lifetime. 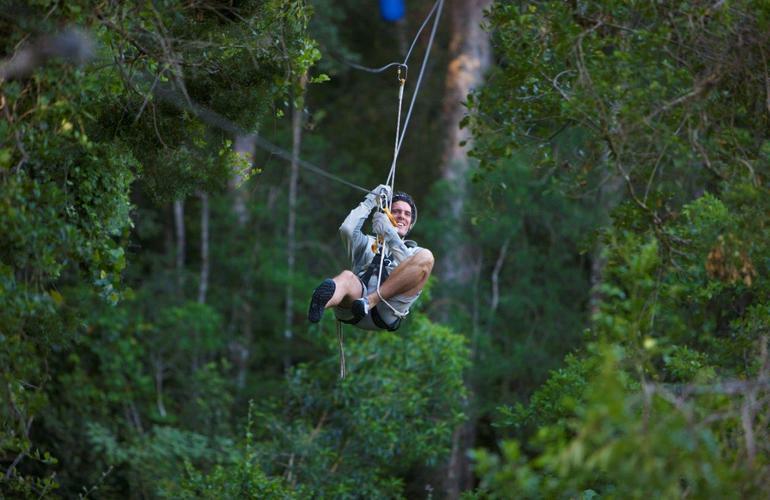 The scenery and birdlife is spectacular and professional guides ensure your safety while keeping you informed about interesting features of the forest ecology. If you are fortunate enough, you will spot a pair of Knysna Loeries or the brilliant red plumage of the elusive Narina Trogon. Whatever happens, you’re sure to be back again! 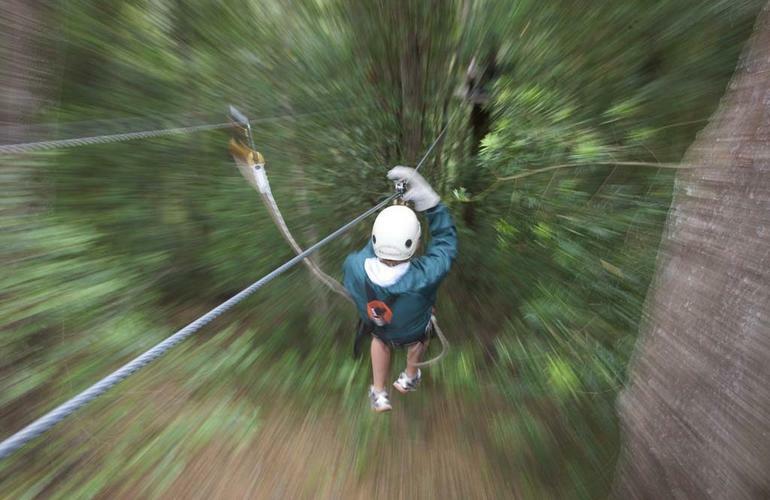 The Canopy Tour starts with a safety briefing at the canopy office. 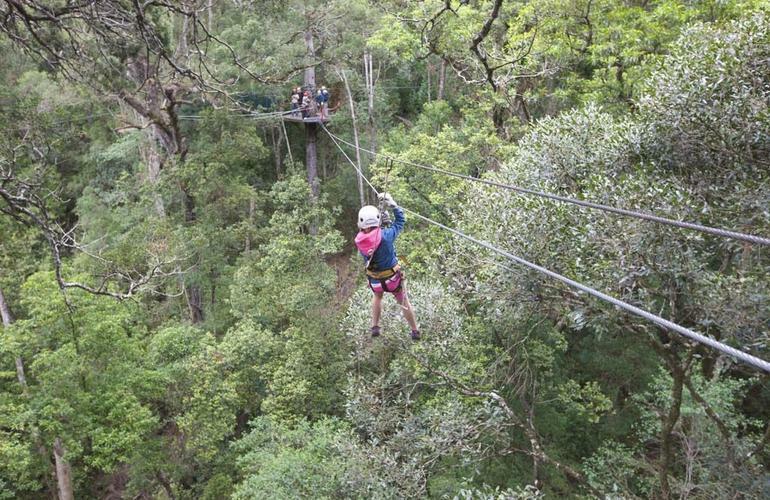 Here your guides will first demonstrate how to slide on the cables and the safety procedures to be followed on the tour, before kitting you up with full body harness, pulley, climbing equipment and safety helmet. 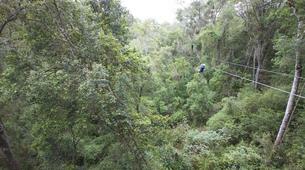 Your group will then be transported in an open vehicle to the start of the canopy tour. 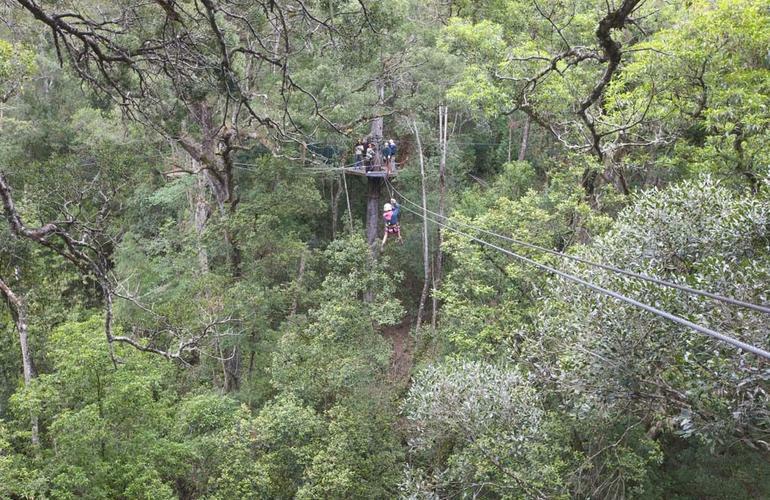 From the moment you launch off the first platform, a new world unfolds as you slide on a steel cable across to the next viewpoint. Once you arrive at the platform, you'll be encouraged to stop for a while and enjoy the view while your guide points out interesting features or facts about the surrounding ecology. 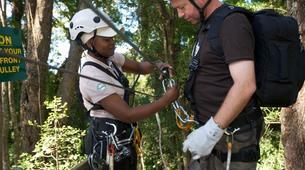 All groups are escorted by a lead guide and safety guide at all times. 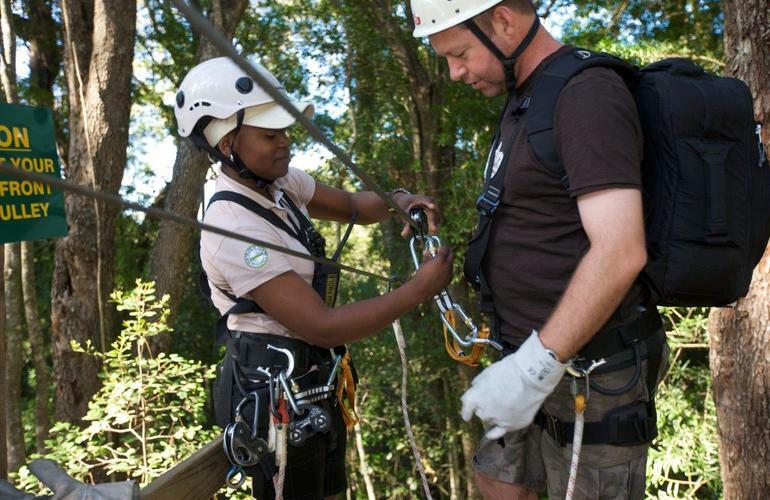 Your safety is paramount and the team has strict procedures in place to ensure that you are constantly connected to either the cable or the platform. 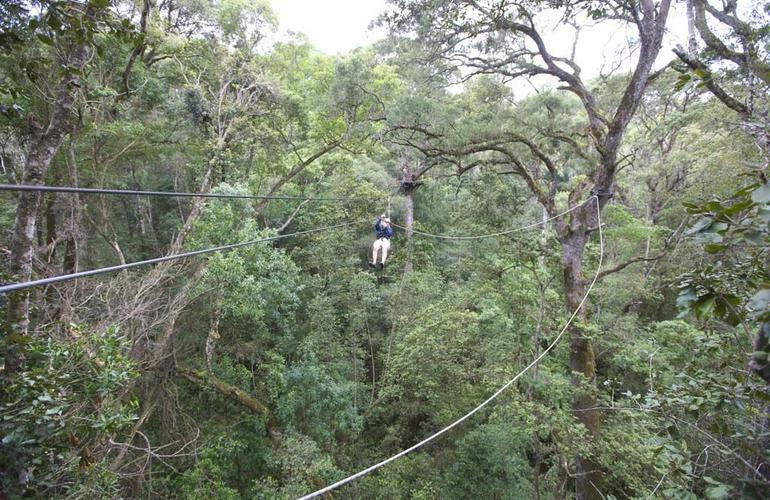 Each tour lasts between 2 – 4 hours, depending which particular Canopy Tour it is and how many people there are in your group. Upon returning to the office you will enjoy a well-deserved meal and refreshments. 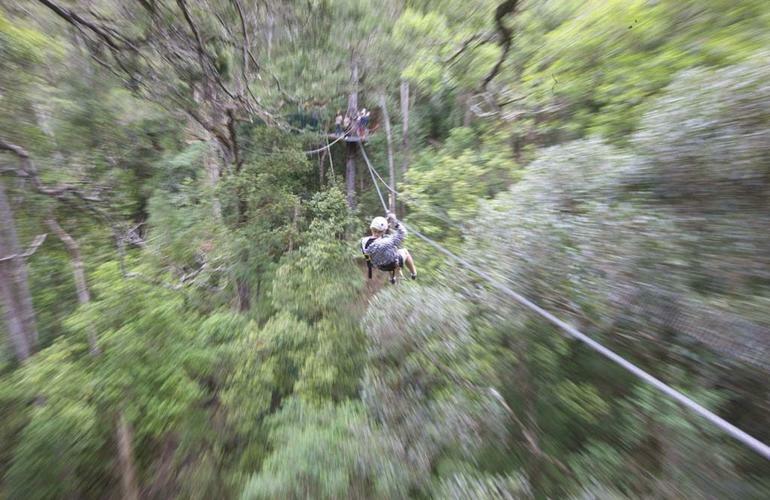 Many people are nervous about the prospect of their first Canopy Tour® and some are just plain scared of heights. For those who don’t think they can do it on their own can opt for the tandem tour which allows you to take in the whole experience while safely attached to a guide who controls your speed and ensures your safety. 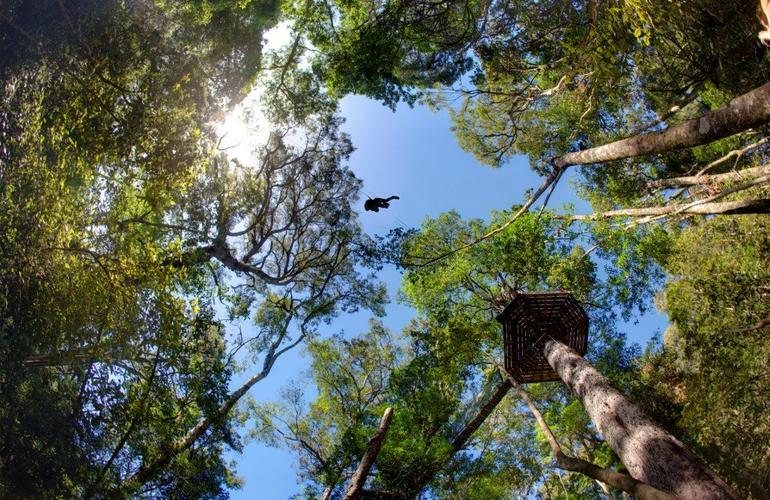 Canopy Tours are certainly not a high adrenaline activity like bungee jumping and most people, even those who are slightly nervous at the start, quickly adapt to the concept and have no problem at all on the slides. Q. When is it open? In summer from 07:00 – 16:00 and winter from 08:00 – 15:00. Tours depart ever 45 minutes and are conducted in most weather conditions. Q. 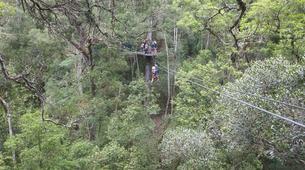 What if I’m scared of heights? 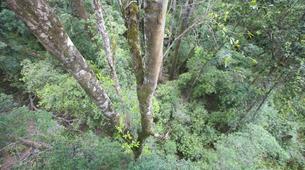 It is quite normal to be afraid of heights. 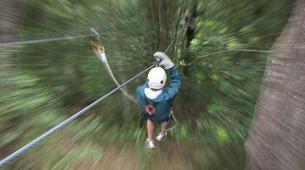 Many of clients arrive at the canopy tour a little nervous and are often quite anxious on the first slide. The experience may even be a bit scary. But for most of you by the end of the tour these fears will have disappeared and been replaced with an immensely rewarding sense of achievement. 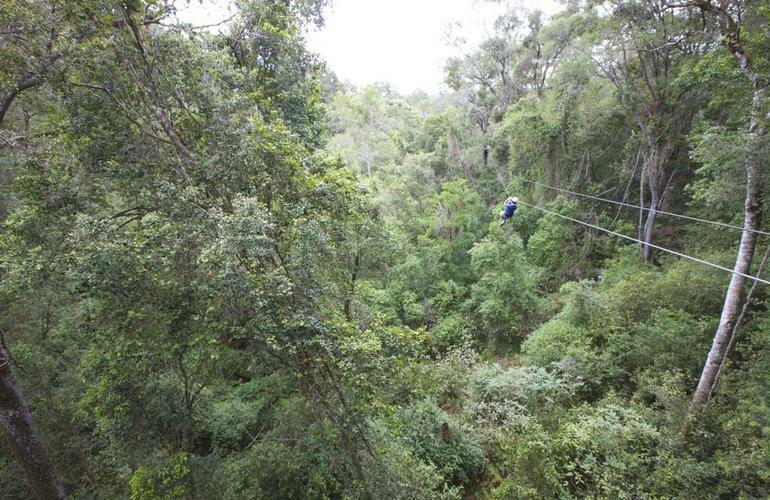 You can even take home your own Canopy Tour completion certificate if you need to prove it to your friends! Q. What if I weigh 150kgs? Then your nervous guide will probably suggest you take a short stroll around the forest instead. The recommended weight limit is in fact 120kg. Q. How old or fit do I need to be? 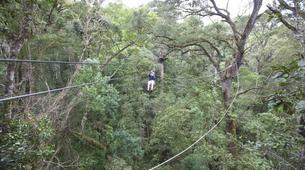 The brochures say that anyone between 7 and 70 is welcome on the canopy tour. However, the current youngest and oldest client records stand with a 4 year old and an 85 year old! 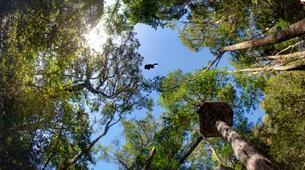 The Canopy Tour® is not very physically demanding and as long as you are able to walk out of the forest over uneven ground. Those who do not have the ability to regulate their speed on the slides will be able to go in tandem along each cable with one of the trained guides. Q. What do we need to wear or bring? Open sandals are not suitable as they will simply fall off. Shorts or long pants are fine but mini-skirts are not. Running shoes, takkies, and veldskoene are perfect and strap-on sandals will do. Don’t forget to bring your camera as there are many excellent photo opportunities along the way. 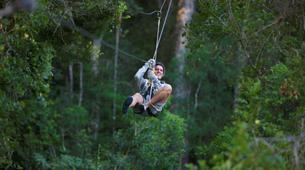 It was great, a little more information about the area, the wildlife and foliage present would elevate the experience. 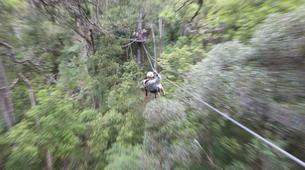 Fun way to explore the forest. Awesome experience. Pragtig en mooi!! Pragtige plek. Awesome views. What a thrill! 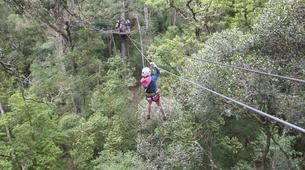 I enjoyed my time in the trees, I felt one with nature. Hennie explained the life of the trees so well. The activity was educational and fun. I enjoyed every moment.